My great friend Tim is visiting this weekend and he's come all the way from Kuala Lumpur. That's the capital of Malaysia as everybody knows. Right? Anyhow, yesterday we went to the Museum of Fine Arts here in St. Pete where we saw an exhibition of the photography of Len Prince. Len Prince is a well known editorial and fine art photographer and since 2001 he's been collaborating with his muse Jessie Mann. Mann is an artist in her won right and together, they have been working on a series of images that are at once homages to iconic images and commentaries on the collaborative nature of art and performance. I was transfixed. The exhibition is making the rounds of the country and if you see it scheduled for a museum near you go. Go for a couple of reasons. The first being that it's a compelling series of images that's every bit as unsettling as it is gratifying and the second being that museums everywhere are screaming for patronage. If keeping The Arts alive means anything to you, please patronize them. Everybody knows the iconic image of Sandro Botticelli's Birth of Venus. In it, Venus arises from the foam of the sea a fully-formed (and sexually charged) woman. She's a Renaissance ideal --blond, fair skinned and a little zaftig by today's standards. 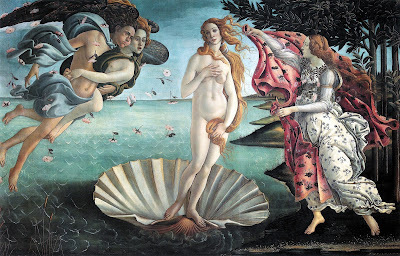 She's standing in a classic contropposto pose, though as was often the case with Botticelli, her pose and her proportions are anatomically impossible. 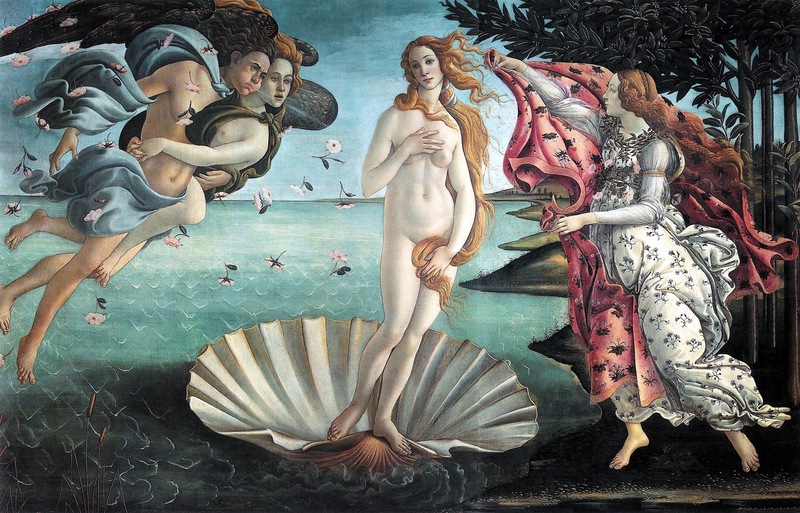 Botticelli dealt in fantasy and avoided the realism and deep perspective of his 15th Century contemporaries. In the hands of Prince and Mann, Venus gets the white trash treatment and I think the image is hilarious and sobering at the same time. Though hardly a fantasy setting for a lot of people, it reflects a reality most people would rather ignore. Venus steps from a concrete, shell-shaped birdbath and instead of being greeted by the western wind and a shower of flower petals, she's left to her own devices in the overgrown courtyard of a low rent hotel. Great work! You can see more images from the Len Prince and Jessie Mann collaboration on the Edelman Gallery website. Starting with Len Prince's homage to The Birth of Venus, see what other icons you can name. It's great fun. Really! I love Venus' bad wig too, it's really the crowning touch. It really does make the photograph. The image in real life shows off how scratchy/ fake it is. Wonder how she gets her hair so shiny??? ?